The Cooperation and Communication Planning Unit (CCPU) is the central intelligence of the interACT automated vehicle. Safe integration of automated vehicles in mixed traffic environments requires the ability, from the automated vehicle’s side, to interact with the other traffic participants in an intuitive and expectation-conforming manner. Thus, the objective of the CCPU is to predict the evolution of each encountered traffic situation and plan the reaction accordingly while appropriately communicating the automated vehicle’s intention to the other traffic participants as well as to its on-board user. During the automated vehicle’s journey, the CCPU classifies the perceived traffic scenes among a reduced set of scenarios that have been carefully selected within the project and are being digitalised in the form of a knowledge base. 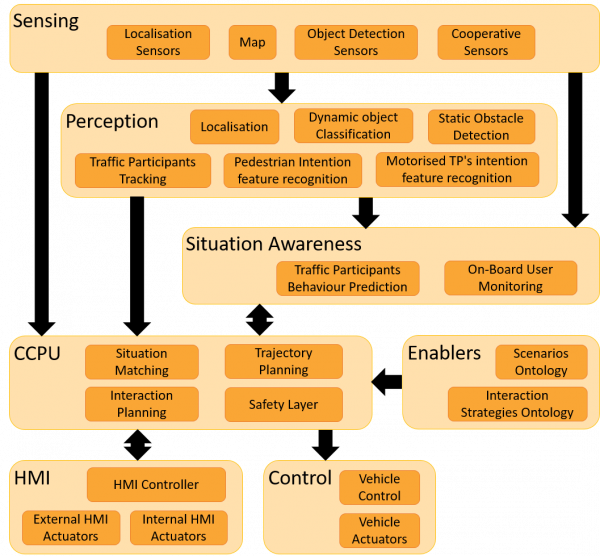 Based on this classification and on the predicted behaviour of the other traffic participants, the CCPU is able to assess how the traffic scene may evolve from the automated vehicle’s perspective. Considering the future motion of both the automated vehicle and the other traffic participants, the time-synchronised planning of the automated vehicle’s behaviour and the sequence of explicit HMI control are being composed. This result, namely the interaction plan, comprises commands for the vehicle trajectory planner as well as for the HMI components and is selected from a pre-defined set of interaction strategies. Those interaction strategies are sequences of interaction based on the observational studies carried out within interACT which are being digitalised to form a knowledge base for the CCPU. Finally, to ensure safety, the trajectory plan is being monitored by a safety layer, which is able to execute a safe trajectory for the automated vehicle in case any potential unsafe action is detected.